[144 Pages Report] The serverless architecture market was valued at USD 3.20 billion in 2017, and is expected to reach USD 14.93 billion by 2023, at a Compound Annual Growth Rate (CAGR) of 28.6% during the forecast period. The base year considered for the study is 2017 and the forecast period considered is 2018–2023. Serverless architecture is a branch of cloud computing in which developers can write codes and develop applications on virtual systems, without worrying about the infrastructure and server. Serverless architecture is principally a union of self-managed functions and cloud services that serve as serverless applications. System Operators (SysOps) are the administrators of multi-user computer systems that deal with the traditional way of managing server infrastructure. SysOps includes everything, right from provisioning, configuration, and patching to updating, securing, and monitoring the servers. DevOps has brought a change to SysOps by bridging the gap between developers and the operations team. The rise of microservices and serverless computing is fundamentally changing DevOps by blurring the line between development and operations. The serverless architecture platform is automated and abstracted to the extent that it does not need an operations team to manage it. The research methodology used to estimate and forecast the serverless architecture market began with capturing data from the key vendors’ revenue and market size of the individual segments through secondary sources, industry associations, and trade journals, such as the World Analytics Association and the Cloud Native Computing Foundation. The bottom-up procedure was employed to arrive at the overall market size of the serverless architecture market from the individual segments. 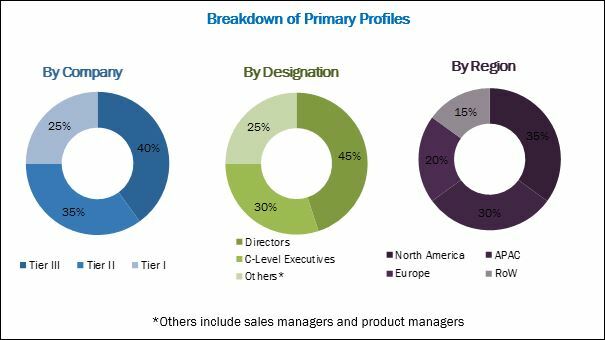 After arriving at the overall market size, the total market was split into several segments and subsegments, which were then verified through primary research by conducting extensive interviews with the key industry personnel, such as Chief Executive Officers (CEOs), Vice Presidents (VPs), directors, and executives. The data triangulation and market breakdown procedures were employed to complete the overall market engineering process and arrive at the exact statistics for all the segments and subsegments. The serverless architecture market ecosystem includes players, such as Google (US), AWS (US), IBM (US), Microsoft (US), Oracle (US), CA Technologies (US), Rackspace (US), Alibaba (China), TIBCO (US), Platform9 (US), Syncano (US), NTT Data (Japan), Joyent (US), Iron.io (US), StdLib, Realm (US), Galactic Fog (US), ModuBiz (US), Tarams (US), Snyk (UK), Dynatrace (US), Fiorano Software (US), Manjrasoft (Australia), SixSq (Switzerland), and Twistlock (US). The study includes the market segments, such as service types, deployment models, organization size, verticals, and regions to arrive at the market size of the global serverless architecture market during the forecast period. What are new application areas for the serverless architecture market? The serverless architecture market is expected to grow from USD 4.25 billion in 2018 to USD 14.93 billion by 2023, at a CAGR of 28.6% during the forecast period. It is expected to witness massive growth, due to factors such as the elimination of the need to manage servers for reducing infrastructure costs and easing deployment, management, and execution, shift from the DevOps to the serverless computing, and proliferation of microservices architecture. The increasing adoption of cloud-based applications and emergence of IoT applications are expected to provide growth opportunities for serverless architecture vendors. Serverless architecture helps organizations in managing campaigns, making quick decisions, analyzing markets, and deriving customer insights. Leveraging the diversified advantages of cloud solutions, Serverless architecture vendors are now offering their solutions via SaaS (Software-as-a-service)-based delivery models over cloud. These cloud-based solutions provide a centralized way to monitor sensitive files across organizations. With the prevalent adoption of cloud-based applications, enterprises are moving away from the monolithic application approach and swiftly implementing the serverless architecture. The global serverless architecture market has been segmented on the basis of service types, deployment models, organization size, verticals, and regions. The service type segment has been further divided into automation and integration services, monitoring services, API management services, security, support and maintenance, training and consulting, and others (metering and billing, reporting, and analytics services). The deployment model segment comprises private cloud and public cloud models, which assist in deploying serverless architecture. The verticals include Banking, Financial Services, and Insurance (BFSI), telecommunications and IT, retail and eCommerce, healthcare and life sciences, government and public sector, manufacturing, media and entertainment, and others (transportation and logistics, energy and utilities, travel and hospitality, and education). 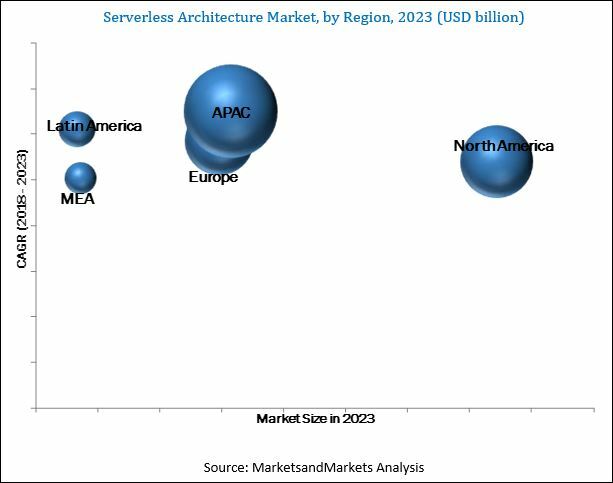 Based on regions, the serverless architecture market has been segmented into North America, Europe, Asia Pacific (APAC), Middle East and Africa (MEA), and Latin America. Based on service types, the automation and integration services segment is expected to lead the serverless architecture market from 2018 to 2023. Automation services help efficiently manage microservices, which are deployed on hybrid IT platforms, to provide faster response along with optimum resource utilization. Integration services combine and consolidate the data and function of multiple microservices. Automation and integration services need to be carefully designed for promoting portability and adopting the microservice-based architecture that is required while implementing serverless architecture. On the basis of deployment models, the public cloud deployment model is expected to grow at a higher CAGR during the forecast period. The growth of the public cloud segment can be majorly attributed to its high adoption among cloud storage providers, ease of access, and faster deployment. The serverless architecture market has been segmented on the basis of organization size into large enterprises and SMEs. The large enterprises segment is expected to lead the serverless architecture market from 2018 to 2023. The adoption of serverless architecture services among the large enterprises is expected to be high, owing to the ever-increasing demand for cloud automation and this trend is expected to continue during the forecast period. The large enterprises are heavily investing in advanced technologies to increase their overall productivity and efficiency. Based on verticals, the media and entertainment vertical is expected to grow at the highest CAGR during the forecast period. In the past, media and entertainment companies faced the challenge of managing and supporting complex workflows, and new data formats with uncertain revenue and monetization. To manage the enormous volume of digital media and data generated across applications, serverless architecture offers an attractive solution. It enables the media and entertainment companies to manage their processes and workflows in an efficient, scalable, flexible, and reliable manner. Among regions, North America is estimated to account for the largest market share in the serverless architecture market in 2018. North American countries are early adopters of the serverless architecture technology. Some of the major vendors operating in this region are Microsoft (US), AWS (US), Google (US), and IBM (US). It is the most developed market in terms of cloud adoption, due to various factors such as standard regulations, advanced IT infrastructure, the presence of a large number of enterprises, and availability of technical expertise. BFSI is one of the major verticals that have leveraged the benefits of serverless architecture. The vertical collectively includes organizations that are into banking services, such as core banking, corporate, retail, investment, private, and cards; financial services, such as payment gateways, stock broking, and mutual funds; and insurance services covering both life and general insurance policies. The BFSI vertical is constantly evolving and is characterized by intense competition, worldwide expansion, consolidation, varied regulatory norms, and constantly changing consumer demands. Serverless architecture supports real-time applications and provides a scalable and secure platform for providing real-time information as required by the BFSI vertical. A growing number of users and increasing adoption of various technologies related to media and digital content are driving the demand for efficient and secure serverless architecture across the telecommunications and IT vertical. Moreover, telecommunications and IT companies face the challenge of evolving customer requirements. Moreover, the ever-changing needs arising out of change of plans, devices, and payment models make things more challenging for operators. The retail and eCommerce is a major industry vertical in the serverless architecture market. This is mainly attributed to the rising consumer purchasing power. With the advent of online retailers, retailers are adopting more innovative technologies, such as cloud computing, big data analytics, digital stores, and social networks. The vendors for an industry need a comprehensive cloud environment to offer their respective product and service portfolio to the customers. The serverless architecture market has been demonstrating considerable growth, but the lack of security and strict compliances may restrain the growth of this market. Key players operating in the serverless architecture market include Google (US), AWS (US), IBM (US), Microsoft (US), Oracle (US), CA Technologies (US), Rackspace (US), Alibaba (China), TIBCO (US), Platform9 (US), Syncano (US), NTT Data (Japan), Joyent (US), Iron.io (US), StdLib, Realm (US), Galactic Fog (US), ModuBiz (US), Tarams (US), Snyk (UK), Dynatrace (US), Fiorano Software (US), Manjrasoft (Australia), SixSq (Switzerland), and Twistlock (US). These companies focus on the adoption of various growth strategies, including new product launches, product enhancements, partnerships, and collaborations, to strengthen their positions in the serverless architecture market.